How Does a Far-Infrared (FIR) Sauna Work? How Will I Feel in a Far-Infrared (FIR) Sauna? Who Should Not Use a Far-Infrared (FIR Sauna? There’s a lot of buzz in the alternative health world surrounding far infrared saunas. They are claimed to help us detox, alleviate chronic pain, reduce stress, and to support cardiovascular problems and diabetes. On a recent visit to the picturesque Amchara retreat in Somerset, I decided to try out to a far-infrared sauna for myself. Far-infrared saunas, often called FIR saunas, are different to a traditional heated sauna in that they emit light rather than heat. The type of light waves emitted are at the far end of the infrared spectrum, which our eyes can’t detect. Far-infrared light rays are believed to penetrate several centimetres into the skin and subcutaneous tissues without increasing body temperature or irritating the skin. The idea is chemicals and other toxins which have accumulated in our bodies are released as a result. Heat has been used to heal the body for thousands of years. Many cultures including ancient Chinese medicine used hot air baths and sweat lodges for stress relief, relaxation, aiding joint and muscle pains and for detoxification. We know heat can be therapeutic, with many beneficial effects seen from raising the core body temperature. Light rays differ in their length. The longest rays at the far end of the electromagnetic radiation spectrum are called far-infrared rays. Because they possess light energy, they are able to affect certain molecules in the body, effectively altering their way they vibrate. However, the light rays don’t produce heat in the same way as a traditional sauna, so all you will feel is a gentle radiant heat. The FIR light rays are able to penetrate the skin by up to four centimetres (1). Because of their effect on the molecules in our cells, they effectively warm the body from the inside. This can increase blood circulation and encourage the relaxation of blood vessels. However, FIR light therapy appears to have beneficial effects on the body in addition to those connected with heat. Scientists believe these benefits could be a result of effects of the light rays on bonds between water molecules in our cells which in turn alter the structure of our cell membranes (2). The far-infrared sauna looks like a normal sauna, but it doesn’t heat up. The reason traditional saunas use heat is it can effectively increase circulation and remove toxins in the sweat. For people who are uncomfortable in heat such as those suffering from chronic fatigue, far-infrared saunas can be useful as they are better tolerated. It’s estimated there are as many as 75,000 chemicals in regular everyday use, so it’s impossible to avoid exposure to them all. Many chemicals accumulate in our body fat and because we are at the top of the food chain we are also exposed to chemicals eaten by food animals and fish. Many people choose to undertake a juice cleanse (also known as a juice fast) from time to time with a view to encouraging the elimination of these stored toxins. During the first few days of the cleanse, you’ll often experience so-called detox effects, which are symptoms which occur when the liver struggles to keep pace with the speed at which toxins are eliminated. These temporary detox symptoms can be as individual as the person themselves but can include headaches, skin rashes, joint and muscle aches, foggy thinking and fatigue. Anything which can improve circulation, lymph flow and metabolism may help to remove these toxins and therefore reduce unpleasant detox effects. For me, it certainly shifted the niggling headache which had hovered over me throughout my second day of juice cleansing. Let’s have a look at some of the benefits of FIR saunas which are supported by science. Researchers studied people with rheumatoid arthritis and ankylosing spondylitis, giving them eight FIR sauna sessions over four weeks. Patients experienced less joint pain and stiffness, as well as a reduction in fatigue, with no side effects (3). FIR light therapy has been also found to help reduce fatigue, pain and sleep disturbance in patients with chronic fatigue syndrome (4). Another study found pain was reduced by half in patients suffering from fibromyalgia after just one FIR light therapy session (5). FIR saunas can also be useful for recovery from sports injuries. Patients suffering from Type 2 diabetes received 20-minute FIR light sauna treatments three times weekly over three months. Study researchers noted the participants reported improved quality of life, including reduced stress and fatigue and better general health (6). FIR sauna therapy has been widely studied in relation to cardiovascular health. One risk factor for heart disease and inflammation in the body is the health of the lining of the blood vessels. FIR light therapy has been found to encourage the relaxation of these blood vessels, leading to healthy circulation. Fifteen minutes of FIR light therapy per day been found to normalise blood pressure as well as a marker of oxidative stress, which is caused by free radical damage. Unless neutralised by antioxidants, free radicals can damage blood vessels by oxidation which is a risk factor for atherosclerosis. One study found 15 minutes of FIR light therapy per day for two weeks improved abnormal heart rhythm in patients with congestive heart failure (7). Some of the beneficial effects of FIR light sauna therapy on the cardiovascular system are thought to be related to the production of nitric oxide, which is an important signalling molecule in the body. Nitric oxide causes the relaxation of muscles in blood vessel walls and reduces the clumping together of platelets in the blood. Nitric oxide has been found to reduce the pain of angina and it’s also involved in healthy kidney function. FIR light saunas have been found to increase our production of nitric oxide. One small study even found obese subjects lost body fat and body weight after FIR light sauna sessions, although the reason for the weight loss was not clear (8). One interesting study combined daily FIR light sauna sessions with other therapies including cognitive behavioural therapy, rehabilitation and therapeutic exercise for four weeks. Pain, depression and anger significantly decreased far more after combining the therapies and the sauna than with the rehabilitation therapies on their own. There seemed to be an ongoing benefit, as the positive effects were still noticeable when patients were assessed two years later. Many of the patients were able to return to work significantly sooner (9). FIR light therapy has been found to increase serotonin levels in patients suffering from depression and insomnia (10). Serotonin is sometimes known as the ‘happy’ brain chemical, and its levels are often reduced when we suffer from low mood and depression. The air temperature in a FIR sauna does not get too hot, so it’s incredibly comfortable. Many people reach a tipping point in a normal sauna where they simply have to leave. This wasn’t an issue for me in the FIR sauna. Some people will sweat and I found I did sweat just a little, but nothing like the amount I sweat in a regular sauna. Increased body temperature and heart rate lead to your blood vessels dilating and an increase in blood circulation. This can produce a similar uplifted feeling to the way we feel after moderate exercise. Many people report feeling pleasantly relaxed. Although the maximum benefit of a FIR sauna is obtained from a 30-minute session and it’s possible to comfortably remain in the sauna for this length of time, it’s important to start with shorter sessions of around five minutes and build up slowly. After your sauna, it’s recommended to shower to remove toxins which may be on the skin. It’s also a good idea to replace any lost salts by adding a punch of Himalayan pink salt and a squeeze of lemon juice to a glass of water after you finish your sauna. Who Should Not Use a Far-Infrared (FIR) Sauna? Be cautious if you have low blood pressure, heart disease, skin problems and dermatitis, kidney problems or if you are pregnant. Occasionally, some people may feel dizzy or nauseous, so if this applies to you, limit your FIR sauna sessions to short periods only and increase the duration very slowly. 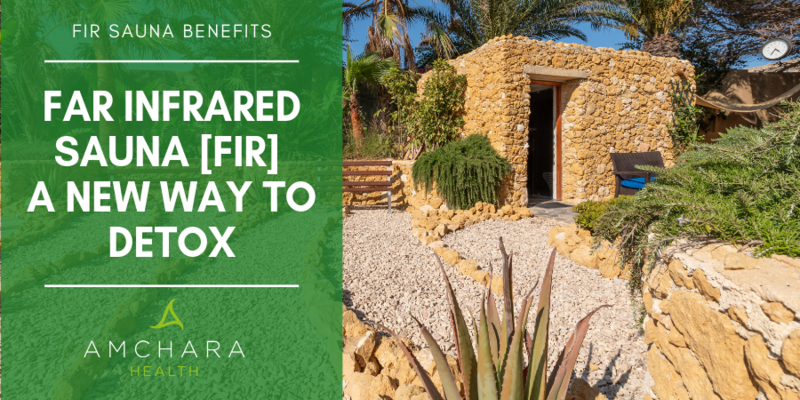 If you would like to experience the benefits of a FIR sauna, why not combine it with a health retreat at Amchara in sunny Gozo or peaceful Somerset? As an adjunct to a cleansing programme, FIR sauna sessions are a relaxing, uplifting way to support your health and detoxification processes. With your comments we’d love to continue the conversation. Have you experienced a FIR sauna? Did you find it helpful?